The Cover Guy Deluxe is a 5″ – 3″ tapered hot tub cover. This cover is the #1 selling replacement hot tub cover in North America. 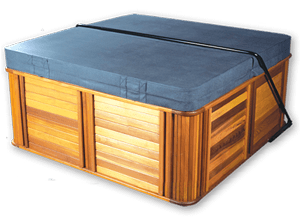 The deluxe hot tub cover will last longer & perform better than any other spa cover available. Built to keep the heat in and the cold out! The Deluxe will withstand harsh winters & save on energy costs. Whether your in Maine or Miami, Minnesota or San Diego the Deluxe Hot Tub Cover is perfect for your climate! Please Click the “Order Now” button below to build your cover in 5 easy steps. Our #1 seller, built to Keep the Heat in and the Cold Out! the foam thickness is 5″ – 3″ tapered which allows rain, ice and snow runoff. CFC-free foam-our foam manufacturing process uses steam rather than ozone-depleting freon agents thus protecting the ozone layer. we only use the highest density foams, which can withstand heavy loads including harsh snowfalls, children, and animals. We do not use or offer any inferior (1.0lb) or non-virgin foam like a lot of other manufactured covers. the stitching is all reinforced with over 20 points of internal reinforcement at high stress and problem areas. we only use the highest marine grade vinyl with UV & mildew inhibitors to keep its beauty through all seasons. we use a aluminium reinforcement stiffener down the center for added strength. all foam is coated and wrapped with our new technology for ZERO water absorption, which means our hot tub covers do not get waterlogged like some other manufactured hottub covers. all our hot tub covers come with our double reinforced folding hinge and tear free handles to insure trouble free cover removal. comes with 4 lockable child safety tie downs for security. the cover exceeds all ASTM standards for hottub (spa) covers. finished off with a 5 year warranty. The Cover Guy Guarantees the Best Quality Spa Cover at the Best Price!